While we at Yeak Inc. are focused on Cambodian culture and dining, not everyone working at the World Headquarters is Cambodian. So to help educate those of us who don’t know too much about what Cambodian dining is like (also because it was 100+ degrees at the HQ and the A/C was out) we went to Cambodia Town. Cambodia Town is a section of Long Beach, California, about a mile long founded by refugees in the late 1970s for a variety of reasons, but most of them related to fallout from the Vietnam War. Home to over 15,000 Cambodian-Americans (source: U.S. Census), this vibrant community has a lot going for it we will touch on in later blog posts. For now, we are going to talk about one of our favorite things: food (we also like football….both kinds, but that’s beside the point). 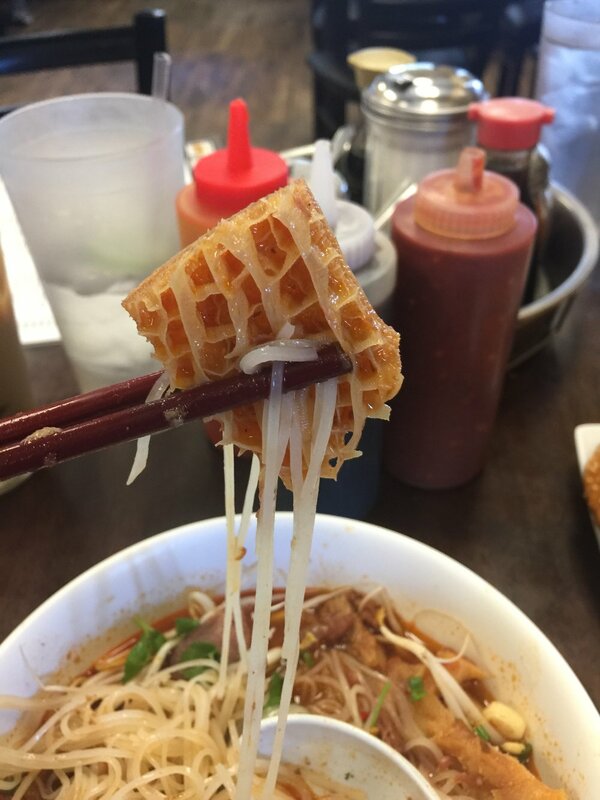 Opened in 1985, Phnom Penh Noodle Shack gives eaters a comfortable environment and simple Cambodian dishes for anyone to enjoy. The first place we went to was Phnom Penh Noodle Shack, cool little place on Cherry. Keep an eye out for it because it’s easy to miss unless you’re looking for it. It gets crowded fast so if you're coming for lunch, get there before noon or be prepared to wait. But it's so worth the wait! We ordered Kathiew Phnom Penh, or what can be considered a Cambodian version of phở. Which isn’t a knock on it. Pretty much every society has some version, even something like Matzoh ball soup is pretty similar. We are really impressed with Kathiew Phnom Penh, though. While similar to phở, it had a lighter broth and to us, not as salty. It’s on the menu as #1, served with french type bread. 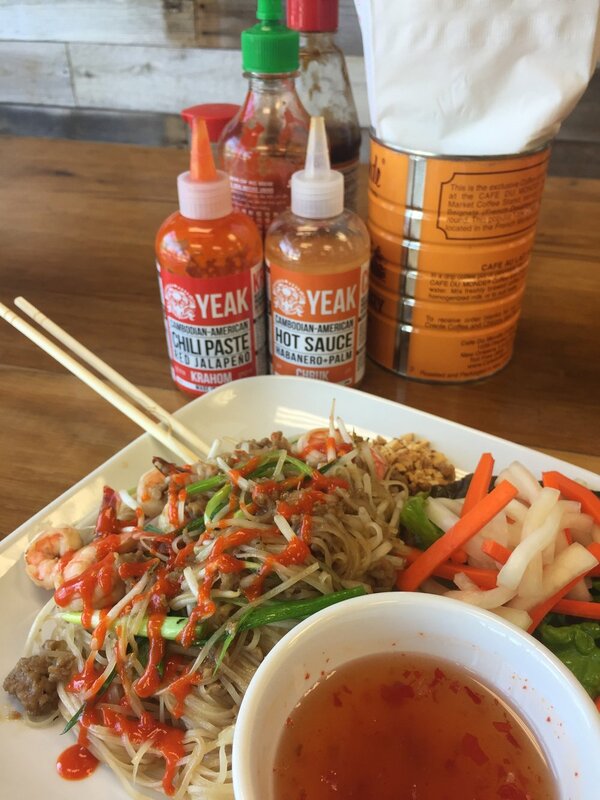 We threw in a little Yeak’s Chruk hot sauce to kick it up, but it probably wasn’t needed. The soup isn’t spicy but we were in that type of mood. To go with it we also had Cambodian iced coffee, and on a hot day ….cold+caffeine=happiness. So whats the difference between Kathiew and phở? Kathiew is traditionally made with pork and chicken bones. 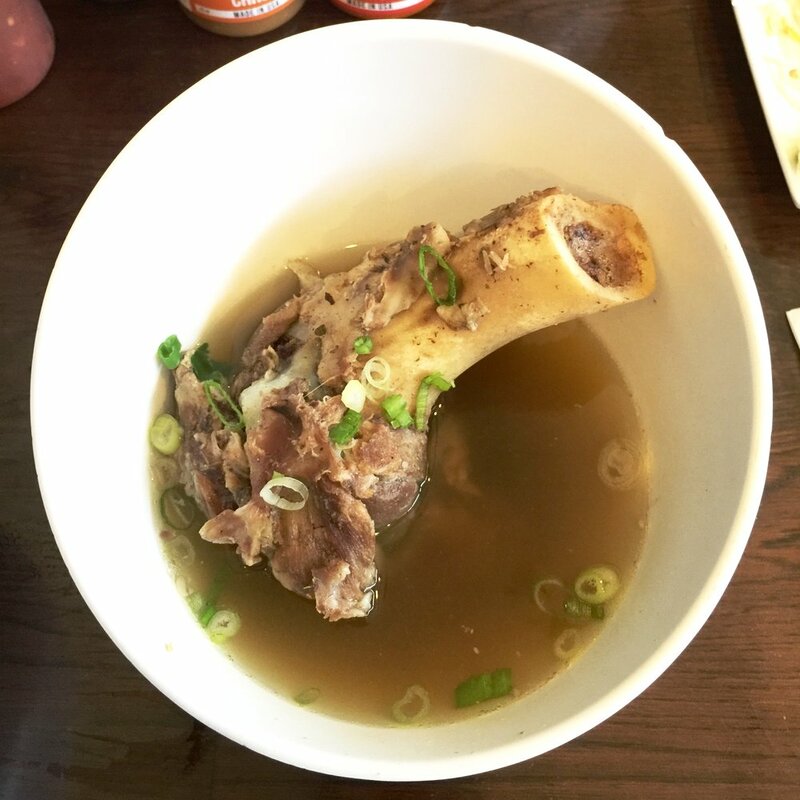 The broth is a little more richer, and darker because pork bones are used. Kathiew broth uses dried squid in place of fish sauce and you'll also find pickled radish in it. Phở on the other hand is made with beef bones, the broth is lighter in color, and cinnamon is commonly used in phở broth, while star anise is used in kathiew. Another major difference is the garnishes used. Kathiew is usually garnished with fried garlic, minced pickled radish, ground pork, shrimp, and organ meat. Phở is different cuts of meat coming from a cow (brisket, tripe, loin, oxtail, and so on...). Look for the Yeak sign! But we weren’t done with our eating tour! We then headed a little East to Nuddlehaus in Lakewood. A Cambodian place with a modern vibe, we settled in for more good eating. The spring rolls we had were regular spring rolls, but you can’t go wrong with them and we enjoyed that nice clean flavor that comes when they are done right. We moved on to Kwah Koh, a Cambodian style sausage that some of us were surprised about. Sausages from Southeast Asia aren’t well known, but they do it well and definitely worth trying out. What makes Kwah Koh unique is how it's a bit sour. The sausages are allowed to ferment giving it this amazing sour profile that cuts through the fattiness of the sausage. Something we like about Nuddlehaus, and a big reason we would recommend going, is their willingness to experiment. They have a chalkboard where they have a variety of specials not on the menu. These test kitchen foods prove to be very interesting and if we could get there more often we would love to keep checking on the revolving dishes. We had the Krahom Honey BBQ Wings that day. They serve the Yeak Inc hot sauce at the tables, and, unknown to us, had created a bbq sauce for the hot wings that day using Krahom. It came out awesome! The smoky light heat from the sauce worked really well and we may have to bug them for the recipe. It’s easy to lump in Cambodian food with Vietnamese, but they are different. The geographic area and the way they tend to be talked about in the same breath, being so close to each other really doesn’t do either justice. They have very different flavors for signature dishes and, because they take on similar dishes, it becomes a lot of fun comparing them.